In the aftermath of Hurricane Harvey and its accompanying flooding, the familiar stories have appeared in the news detailing some of the unfortunate crimes that always seem to happen during one of these types of events, including robbery, fraud, theft or burglary (what some have labeled “looting”). Many are unaware that in the State of Texas we do not only permit the use of deadly force to protect your life and the life of others the same as your own, but to use deadly force to protect property, if certain conditions are met under the circumstance that you are confronted with. In Texas, when can I use deadly force to protect my Property? (B) the use of force other than deadly force to protect or recover the land or property would expose the actor or another to a substantial risk of death or serious bodily injury. In Texas, when can I use deadly force to protect another person’s property? (C) the third person whose land or property he uses force or deadly force to protect is the actor’s spouse, parent, or child, resides with the actor, or is under the actor’s care. Finally, I would advise anyone contemplating the use of a firearm for personal protection to invest in firearms safety and training courses, and to obtain a license to carry a firearm if they are eligible. You do not need a permit to own a firearm or to keep a firearm on property that you own. Without a permit, you may carry a concealed or open-carry firearm while on property that you own. You do not need a license to carry a loaded firearm in your vehicle, so long as the weapon is not on your person, and is not in plain view (basically, if you carry a weapon in a vehicle, keep it in a closed container like the center console or the glove compartment). To carry a firearm concealed on your person, or open carried in a holster, you must have a license to carry a firearm. If you carry a loaded weapon on your person you can be charged with Unlawful Carry of a weapon, a Class A Misdemeanor punishable by up to 1-year in County Jail and a $4,000 fine. If you have been convicted of a felony, there is a discrepancy with Federal law and Texas Law when it comes to your right to own a firearm. Under Federal law, you lose your right to own a firearm indefinitely if you are convicted of a felony. Under Texas law, 5-years after completing probation, parole, or being released from prison you may own a firearm, but ONLY at your residence. If you plead guilty to an assault involving family violence, Federal law treats this as a conviction, even if you are not convicted in court, and you will not be permitted to buy a firearm with a Federal background check. In Texas you may purchase a firearm in a private transaction with an individual without a Gun Dealers license, so long as the buyer proves they are a Texas resident. No records are required to be kept, but I would suggest keeping records in a safe place anytime you engage in a private gun transaction. CHARGED WITH A WEAPON OFFENSE? 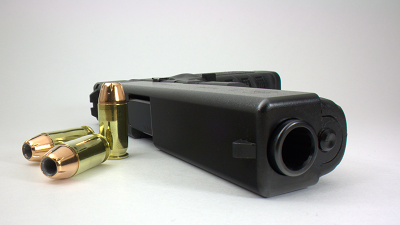 felon in possession of a firearm or ANY gun crime, call LeGrande Law NOW! To fight for your freedom and make sure that justice is done. Contact Criminal Defense Lawyer Tristan LeGrande IMMEDIATELY by calling 281-684-3500.